Power Inspired VIS Series UPS Systems are small compact Line Interactive Sine Wave units with LCD display, IEC or UK socket outlets and USB and RS232 Communications. Available in 1KVA & 2KVA models. Being Line Interactive, the units will track the input voltage and will automagically boost the voltage if it goes too low, or buck the voltage if it goes too high. This stops the UPS from needlessly dropping to battery operation in the event of a brownout or swell. Should the mains supply go outside of these limits or fail altogether, then the unit will revert to supplying power from it’s inverter. It will do this transistion in under 10 one thousandths of a second. During inverter operation, the units produce a high quality sine wave power waveform. 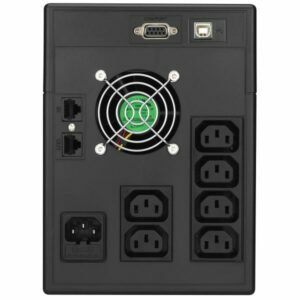 This makes the VIS Series UPS Systems compatible with any load and is particularly suitable for computers with power factor corrected power supplies, and other equipment that does not have an electronic – or Switch Mode – power supply. The LCD display gives an at a glance view of the UPS status. On the left displays the input voltage and on the right the output voltage. Usually these will be the same value, but not always. If the unit is in buck or boost mode the output voltage will be different from the input. When in buck or boost, the AC indicator on the LCD will be flashing to advise you of this. Underneath the mains input indication is a load level bar. Each segment illuminates in approximately 25% increments. It is advisable to ensure that the load indicator is always 3 bars or less as overloading of the VIS Series UPS Systems may occur. 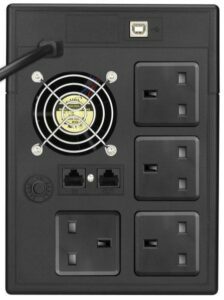 That said, the VIS2000B is a full 1400W continuous load rating which is adequate for all but the most high powered of pluggable applications, and the VIS1000B having a 700W rating. The VIS2000B unit contains 2x 12V 10Ah batteries and the VIS1000B 2x12V 7Ah, and the charge status of these batteries is indicated on the right hand side bar graph. When the unit is running on battery power the battery level will gradually fall to give you an indication of potential runtime remaining. The BATT MODE icon will also be illuminated during battery operation. Other indications on the LCD include Low Battery, Fault and Overload. 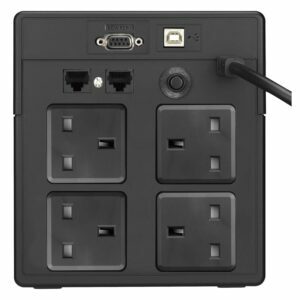 The VIS series UPS Systems contain 4x UK shuttered outlets – note not the “universal type” that some of our competitors offer that are not shuttered (Shuttered means the live pins are closed off when there is no plug inserted). In addition there is a 13A plug on a fitted trailing wire. You just plug your equipment into the VIS2000B, plug the unit into your wall outlet and switch it on – it’s that simple. Alternatively, our IEC versions are more suited to international or standard IEC input applications. The non-fixed input cord also allows for a replacement longer cord if required. A fan is also present on the VIS2000B but this is only active when the unit is “working”. In normal operation the fan is unenergised and the unit is quiet. The VIS1000B does not have a fan and is quiet in all modes (save for the audible alarm). An RJ45 connection is present that provides surge protection for your local network. This prevents “back-door” surges damaging equipment. A circuit breaker is present to protect against short circuits and overload. If it should activate, remove the offending load and press the circuit breaker to reset it. A USB and RS232 port is provided for communication requirements. 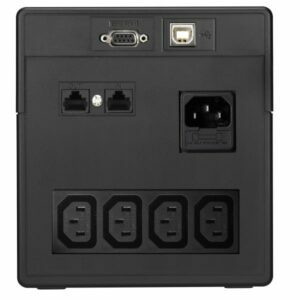 You do not need to connect the equipment for the UPS to operate as intended, but if you install the ViewPower software provided on the connected computer, the software can ensure that in the event of a mains failure, your system can be shut down safely with no loss of data. Software is available for all major operating systems. Operating the unit is simplicity itself. When plugged in, the unit will automatically charge and keep topped up the batteries. You do not need to have the unit powered on. To start power to your loads, press and hold the ON button on the front panel and to switch off do the same. The VIS Series UPS Systems are ideal for all applications but particularly useful for high end computer systems and for applications that should not be powered from a non-sine wave system – such as any applications that contain motors or pumps.